Fig. 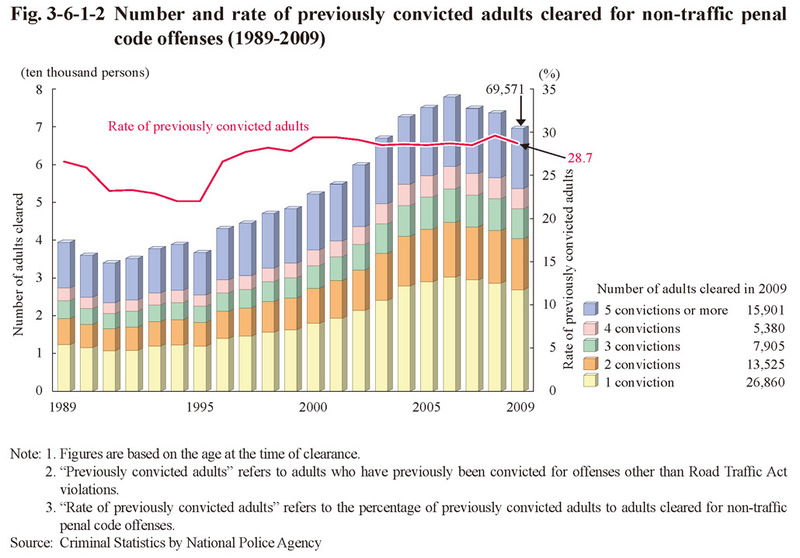 3-6-1-2 shows the number of previously convicted adults cleared for non-traffic penal code offenses (limited to those with previous convictions for offenses other than Road Traffic Act violations; hereinafter the same in this subsection) and the rate of previously convicted adults (refers to the percentage of previously convicted adults to adults cleared for non-traffic penal code offenses; hereinafter the same in this subsection) from 1989 on. 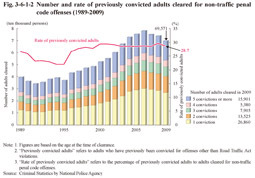 The number of previously convicted adults cleared for non-traffic penal code offenses continued to increase from 1996 on but then decreased slightly over three consecutive years from 2007 on, and was 69,571 in 2009 (down 5.6% from the previous year). However, the rate of previously convicted adults has remained within the range of 22 to 30% since 1989. Examining previously convicted adults cleared for non-traffic penal code offenses in 2009 by number of previous convictions revealed that those with one previous conviction was the highest in proportion at 38.6%, but with the proportion of those with five or more previous convictions also being high at 22.9%. In addition, those with previous convictions for the same type of offense (according to the statistical classification made by National Police Agency) accounted for 50.6% (Source: Criminal Statistics by National Police Agency) (See Fig. 7-1-1-13).